We had a great time hosting our first fireside chat at QuickBooks Connect San Jose. A group of accounting industry leaders sharing their insights at one of the leading accounting conferences…what’s not to love? The answer is absolutely nothing — so that’s why we did it again at QuickBooks Connect Toronto. This time, we invited an even bigger lineup of accounting and bookkeeping heavy hitters to chat with us: Lynda Artesani, Brad Celmainis, Dawne Leaney Davidson, Matthew Fulton, Bill Kennedy, Jacob Schroeder, Tiffany Stewart, and Andrew Wall. The conversation covered everything from adopting new technology (“No matter whether you’re one person or a multinational organization, it’s one bite at a time”) to taking the leap into social media (“I actually started because I was trolling my daughter”) to developing a social strategy — or not (“It’s not so much a strategy as just being aware of what’s going on around me and reacting to it”). To hear more from our guests, check out the video and transcript of the fireside chat below. Rodrigo Fernandez: All right everyone, we are live from QuickBooks Connect in the beautiful city of Toronto in Canada. And I have incredible guests, all influencers, around me, which I’m going to present. But first, let me introduce myself. My name is Rodrigo Fernandez and I’m director of marketing at Method Integration. Method is, of course, the makers of Method:CRM, the number one CRM for QuickBooks, both Desktop and Online. And more than a CRM, Method is a no-code platform that serves small businesses and allows them to build personalized, fully customized applications, enterprise-grade applications to run their businesses and make them grow. 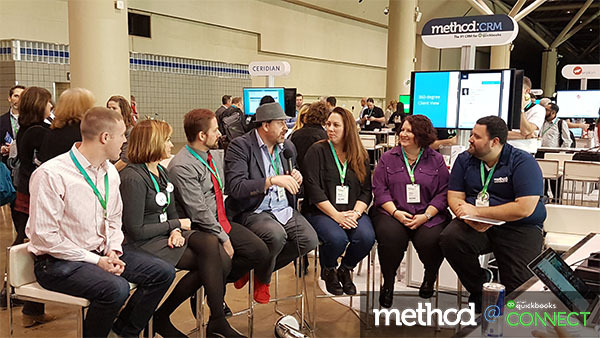 So if you want a trial of Method:CRM because you’ve been inspired by our guests here, just go to www.method.me/qbc18 because we have a special offer for you that you don’t want to miss. So without further ado, let me introduce this powerful influencer lineup that we’ve got for you today. So right next to me, let’s start first with Tiffany. Tiffany Stewart right here is the owner of Tiffany J Stewart, CPA, a practice serving small, medium and large businesses in North America, as well as personal tax clients. She is a co-founder and president of Marabirch Inc and an administrator on QB HQ, together with her awesome friend Dawne. Tiffany is a member of the Intuit Trainer/Writer Network and an Advanced Certified ProAdvisor for QuickBooks Online and Desktop. So welcome, Tiffany. Next to Tiffany is Dawne Leaney Davidson. Now Dawne is the owner of Freelife Accounting and Bookkeeping, a boutique company specializing in small to medium-sized businesses. She is the co-founder and vice president of Marabirch Inc and an administrator also with Tiffany over here on QB-HQ, which is an awesome Facebook online community. Dawne is also a member of the Trainer/Writer Network. Next to Dawne we also have Matthew Fulton. Matthew over there is co-founder and CTO of Parkway Business Solutions, where he uses his passion for technology to create time-saving tools for accountants and bookkeeping as well as [tools that] will fit the needs of all the modern small business owners. Recently entering private beta, his current project, which I find quite interesting, is called Vendorsync and provides bookkeepers and accountants the most efficient bank input process for QuickBooks Desktop by eliminating — get this — over 50% of the data entry requirements. So welcome, Matthew. Next to Matthew is Lynda Artesani. And Lynda is president of Artesani Bookkeeping. She’s an Advanced Certified QuickBooks ProAdvisor for Desktop and Online with diamond level status at Intuit. Lynda is also a member of the Intuit Advisory Council and an expert columnist at the QB community forum. Welcome, Lynda. Next to Lynda is Jacob Schroeder. Jacob is the CEO and founder of Ascend Consulting. He works with small business owners to help them truly understand and assist them with scaling their business. Jacob is also a member of the 2017-2018 Intuit Accountants Council. And last but not least, we have a homegrown family member here, Andrew Wall. Andrew is a QuickBooks Platinum ProAdvisor and the CEO of CPA4IT, a modern cloud accounting firm for small businesses and independent contractors. He’s the owner of WallCPA, a cloud accounting firm that was named Canadian Firm of the Future by Intuit in 2015. Andrew has been named a top 50 cloud accountant by Hubdoc, a top 100 accounting influencer by Avalara, and a top 10 Canadian bookkeeping influencer by K2E Canada — and [he’s] one of our favorites here at Method:CRM. Welcome, Andrew. All right, so I asked this question in our last fireside chat in San Jose. So listen to this: Scott Brinker, who’s one of the chief marketing technologists out there, he says that he believes there are two things that are true, referring to rapid changes in technology. The first thing is is that technology is accelerating super, super fast — lots of changes constantly. The second one is that changes in an organization take a really long time and they’re very hard, right? Do you think the same applies in the accounting industry? If so, how so and how can ProAdvisors and accountants and bookkeepers embrace the reality and sort of stand in front of that train and take it? Andrew Wall: Oh, I think it definitely holds true of this community, probably more so than any other community. Technology is changing rapidly. We just saw, you know, demos today of QB Assistant and what’s happening with voice, and that’s just one little aspect. What’s going on with fintech right now is outstanding. Yet our industry is historically one of the slowest adopters of technology. So how do you bridge that gap when there’s so much new tech coming on? It’s like, how do you eat an elephant — one bite at a time, right? So you have to pick your projects and start. And depending upon the size of your organization, the speed will vary. Because if you’re one man it’s very easy to adapt — or one woman, one person. It’s really easy to just pick up new technology and roll with it. Once you have an organization you have to deal with whole change management and making sure that you’ve got the entire team on board, so there’s a much longer process in that. But no matter whether you’re one person or a multinational organization, it’s, you know, one bite at a time. Pick your piece of tech that you think is the most important priority and start with that. Rodrigo Fernandez: So how are you guys tackling that issue? Jacob Schroeder: So I’m gonna start by agreeing with Andrew. It’s definitely a problem in our industry, of accountants are reluctant to change — probably more so than most people [in] most industries. Because that’s the way accountants are, you know — we are “wait and see” type people. But I think it really comes down to, how are you hiring? It’s one of the big things. So if you hire people who take ownership of process and are constantly looking for improvement, then change management becomes much easier because those people are looking [at] “how can I change and adapt so this process becomes more efficient?” Whereas if you hire people that are just there for the job, they’re not so much looking to improve the process, so therefore they are much more reluctant to change. Rodrigo Fernandez: So from an app perspective, right — so Intuit is investing a lot of money in educating the industry and I think that’s working. And yet the road is actually quite long. What would be your suggestion to us developers? How can we better support the industry in helping you navigate through those waters and take you where you need to be? What would be some of your suggestions? Dawne Leaney Davidson: I think one thing I would say is, I think sometimes you need to be patient with us. It’s very overwhelming for us, the number of apps that are out there, and all the new ones that are constantly coming out, and the new features that those apps are then adding. And so to walk into this room and see all these booths and go, “oh my god, I don’t even know where to start.” And to know that I may talk to you this year, [but] I might not sign up until next year because it’s gonna take me that long to wrap my head around how to make it work. Lynda Artesani: For me, when I hear about an app or somebody tells me about an app, I usually grab it and put it in and do it in my own company to get to know it. Because I can’t be giving it to a client and then saying to the client, “here, go ahead, let me know how that worked out.” Because it could be not a great app too and then I don’t look good, so that’s kind of how I work it. Matthew Fulton: So I think now that the app environment has grown to be so large, the concept of the MVP has to change for software development, especially in the environment when you’re dealing with accountants and bookkeepers, which have a higher expectation of something to work correctly. It used to be that we would develop something and you get it to market as quick as possible because you need to find out if there’s a market for it, because it costs a lot of money to develop, to market, to do everything else. Jacob Schroeder: So I’ll touch on that real quick. Another big thing I think would be really important — as you talked about what you guys can do to help us — is if we could get a real sandbox environment and data to use in that sandbox environment to test how an app works. You know, because many times it’s like, yeah, this is how you say it works, but I need to see how it flows through your software, what the outputs are, how that impacts the tax software, how it integrates with my other apps that I have that I’m using. Because I’m most of the time building a stack, not just individual ones. So that sandbox environment is really powerful, as well as test datasets. You know, because I can pull things from clients so many times, I don’t want to go ask my client for that raw data. I want a set of data that I can look at, understand what the raw data is, shove it through an app and see what comes out. So I think that would be really powerful if we could get that. Andrew Wall: To add on to that idea of the dataset — which I think is critical — but I love when I’ve seen [in] a software that ability where they actually put in the test data and it just guides you. The guided tour, the step-by-step, this is what you need to do: step one, step two. You need to be able to turn that off. But having that when you don’t know the product, when you’re trying to eat an elephant one bite at a time, it’s really important to walk me through the steps, have dummy data there so I don’t have to think. You just guide me and I watch, and take me on a journey. Matthew Fulton: And videos! It’s easy to do. Andrew Wall: Yeah, videos are super easy. Rodrigo Fernandez: And we have Bill Kennedy with us! As you can see, we have a full panel here. Bill, we’re talking about the chasm that the industry is going through and how we, as developers, can help you. But now I actually want to switch a little bit of gears here, because as I said at the beginning, I am surrounded by a whole bunch of influencers. I think together you guys must have over a billion impressions on social media alone. So as we’re talking about social media and, you know, your feedback [about] technology is [that] “we want sample data to play with in a sandbox”. But when you’re trying to build a social profile, you don’t get that sample data, right? Everything is sort of like zero-zero-zero-zero. So let’s talk about social. What are some of the technologies that you’re leveraging right now to help you build that audience or that following? Bill, you want to start? Bill Kennedy: Sure. And a lot of it is [that] you choose exactly who you’re talking to, right? For me, it’s nonprofits and charities. That’s a very specialized area that needs a lot of help, and they’re also very social. So once you get talking to one, you can get the conversation going. And you want to get it outside of the immediate tribe, right? I’m not talking to other accountants as much as I’m trying to convince charities to adopt financial technology. And if you talk the truth in a way that is easily accessible and you’re patient and persistent — that’s my two words, right — just keep doing it, keep getting the message out there. It builds, but it takes time — no question. Rodrigo Fernandez: And what is your platform of choice for communicating with your charities? Bill Kennedy: Okay, so it started with Blogger, and then it moved to WordPress, and then I realized nobody’s coming to my website. So I moved to Facebook, because I tried LinkedIn and I’ve got a big group there, but there’s not a lot of conversation on LinkedIn — it’s all people just pushing out their stuff. [Whereas on] Facebook, there is a conversation. And then at events like this, everybody’s talking on Twitter, and that’s how I find out who to follow and often they follow me back. Rodrigo Fernandez: Tiffany, Dawne — you guys have a huge following on QB-HQ and of course Facebook is is your main group, right? Aside from Facebook, how else are you leveraging technology to build your audience? Tiffany: We’re community builders. So for us, it’s actually the in-person stuff. It’s like the old-fashioned human technology is what we’re using for a lot of the community building stuff that we’re doing. And then I guess the next platform that we really work with is Twitter, because it’s instantaneous and we can share the stuff that we’re working together on as a community. Dawne: I was gonna say the thing that we’re really excited about right now is we’ve actually just launched our QB-HQ for SMBs. We were getting a lot of requests to join the group from end users and from small business users that had heard this was a great place to go to ask their questions about QBO especially. But there are conversations that we have in QB-HQ that we don’t necessarily want our clients to be part of, because sometimes we’re discussing things that we do with our clients and so we don’t always want them to see our secret sauce. And so we’ve started now QB-HQ for SMB, so that those small business end users have a place to go where they can also get that access to QBO support through Intuit as well, because we have members there. But then also asking us questions and us being able to share experiences with them, and then with each other as well. Andrew Wall: I don’t know much about social media [panelists laugh], but I’m actually going to pass this down to Jacob and Lynda. I’m happy to talk more, but I know that they’ve gotta go for council, so I’ll let them start. Jacob Schroeder: So I think Bill hit the nail on the head, when you’ve got to pick your audience, you know. But then it’s looking at innovative ways to attract a new audience. So to come up here, one of the things we did was a GoFundMe page, did a video. And our community then supported us to come up here, which we’re super thankful for — thank you for everybody that contributed to our GoFundMe and helped us come up here. So Matthew, Lynda and I are from the States. We met this community in San Jose and wanted to be part of that global community even more, so we decided we wanted to come up and they supported us. And that’s a different way of reaching out to them, right? And it helps you stand out a little bit by using video, using GoFundMe, using different communication methods. Then people take an interest in you because it’s not the same old stuff, you know, it’s not the same article being posted all the time. So it’s just changing those things up. And being personal about it, I think — it’s not just the robot posting things for your social feed, it’s you actually getting in there and doing it yourself. Lynda Artesani: You know what, as accountants we’re kind of known as being boring. When we tell people we’re going to the accountant convention, they go, “great, happy for you.” But we’re fun! So people don’t know how much fun accountants are. We’re a lot of fun and that’s what makes it fun, right? That’s what makes us get a lot of attention. Matthew Fulton: Sounds good to me. You know, I think what [is] sometimes missed is the power of social media: we may be accountants and you may be thinking that your immediate target audience is supposed to be small business owners. But actually by connecting with other accountants like this, we have a better opportunity to reach those small business owners as well. A big area of focus has always been search engine optimization for myself, and social media plays a big role in that. You will always rank higher on Google platforms if you have your social media tied in. So by collaborating, having fun, you know what I mean? But you’re actually being real and genuine and having fun with people that you can relate to, that’s one of the best ways you can actually end up connecting to potential clients. Lynda Artesani: And the Canadians are a wild bunch. I have to say, the ones I know are really wild and fun. Matthew Fulton: You guys are awesome. Now, the master. Andrew Wall: I don’t know if I have much to add on. You guys have all said it, you’ve hit the nail on the head. And you know, being authentic, obviously. Coming back to technology, I guess there is some technology I use, like Pexels, which is a great tool for getting good- quality free photos. There’s tools like OneStream Live, which allows you to take an old video that you pre-recorded and make it appear live, which then gives you higher impressions. I don’t know whether this is good or bad — these are technologies that I experiment with and that’s one of the things that I do on my social media. I’m not saying it’s right for everybody, [but] I’m constantly experimenting, I’m constantly trying new mics, I’m constantly trying new tech. And I totally geek out on this and I love this, but that’s me, right? Like, that’s my authenticity, so don’t go and copy me — go and be you, do your thing and it will happen organically. And again coming back to this whole “know your community” — because Bill’s right, absolutely, if you can highly target — but I also think that sometimes your community grows itself. And I can tell you for myself, the community that I have today is not the community that I had actually intended. But I love it and the community is people who are like me, who share similar values, who love technology, who are a little bit geeky, who are into finance and technology. And my community has become what I am because my social media is what I am. So your following will be who you are, at least who you are on social media. And the one thing that you do get about social media is the ability to show your best you, right? And that’s also a scary thing when we talk about our children in social media. And I know I gotta shut up and pass the mic, but I think it’s an important thing because social media right now is an intimidating thing for small businesses and it’s an intimidating thing for our children. And there’s a lot of pressure because you see people at their best and you assume that you need to be at that level and you need to be, you know, the best in your game — not realizing every one of us has our dark days, our dark moments and our failures as they set up on stage. And recognizing that very rarely are you seeing those negative moments on social because we’re putting our best foot forward — as we should, right? It’s like when you go to a dinner party, are you gonna show up in a Hawaiian shirt and flip-flops? No, you want to put on a nice coat and, you know, a dress shirt. You want to show your best you and it’s the exact same thing with social media, right — dress to impress. And be yourself, but be your best self. Rodrigo Fernandez: So I love the answer: know your audience, be yourself, use the right technology, and experiment. Now [for] a lot of people, when you combine all those things, it does sound a little bit intimidating, especially if you’re in the process of testing new technologies or new apps. How do you get over the fear of failure or looking silly on social media, like we just did with our mic malfunction technology? Our life gods didn’t really help us on that one. How do you overcome that fear so that you sort of are able to step out of your shell and do it? Tiffany Stewart: I never overcome my fear. And I think that’s probably what makes me authentic and what makes me real, [it’s] that I just try my best and I fail, and I just learn from that and then I just move on. Dawne Leaney Davidson: I think the most important thing is just to be yourself and you’re always gonna have that moment of, “oh my god, what am I about to do?” And you just take a deep breath and you jump in and do it. I know when we moved on in the last or year so, trying to reach out and do new things and try new things — it doesn’t always go the way you think it’s going to, but you always learn from that and you’re always going to get ideas for what to do next time. What can we do better? What could we maybe not do next time? What can we add to the mix? What can we take away that might make it a little bit more effective? Everybody’s gonna fail, but if you don’t learn from it, that’s the missed opportunity. If you get what you can, get the message from it and take it and use that in moving forward, then it’s never a failure. Bill Kennedy: I follow Joan Garry, whose thing is Thriving Non-Profits, and she deals at the board level. And she has this great saying, that if you believe enough in the mission, right, you can overcome your fear. Rodrigo Fernandez: Well, I’ll go to Matthew’s example, right? You started a GoFundMe campaign. Tell me a little bit about that experience, because, I’m sure [there was] the thought of, “man, what if nobody donates? What if nobody helps me and I look foolish?” Tell me about that experience. Matthew Fulton: So I blame everybody that’s up here for that. [Panelists laugh] And the answer kind of goes back to your prior question too. I embraced being a goofball a long time ago. I am very serious when I need to, and very detail-oriented when it’s necessary. But life is so serious all the time that I just like to have fun. I want to make the journey as great as possible. I took a message that Lynda had posted to me in a private message, saying, “oh, let’s go, I think going to Canada would be great.” And I posted [it] up and you two [points to Tiffany and Dawne] jumped onto that real quick, and you’re like, “yeah, that’d be great!” And then it developed from there, joking, “well, we should create a GoFundMe account to do this.” So then I’m on a Friday Night Accountant, so I’m literally just about to come on and [to Andrew] you’re like, “so I keep hearing about this GoFundMe thing, but I never see anything about it.” Then I pop on to the video; I’m like, “don’t dare me, dude.” So we have a little bit of conversation on it and I start to set it up right away. It was a hard time for me to actually post it because, doing a GoFundMe right then — I live in Ventura County and at that exact same time we had just had some very unfortunate circumstances with some fires and a very tragic shooting, and I almost didn’t want to post it. But I actually chose to do so because I felt everybody just needed a smile and that’s kind of what led [to it]. I don’t know how many people saw the video, but I kind of did a little play on some anthems and had some fun, just to get people to smile and it was all about trying to get people together. So my goal out of it, it was never about the money — it was super, I cannot say thank you enough, this whole experience has been phenomenal — it was a fun way to try to get people to collaborate and to get together. And if I hear of at least one other American that came up because of that, then it was a success. But the most important part is we’ve got to get other people to come back up again next year and we need to show the support to our tribe, our pack, as they talk about. Andrew Wall: You know, it’s so funny that you talk about [how] it started on a dare. And our speaker on the main stage, Ilana, talked about, you know, as an entrepreneur — starting with a dare and escalating those dares. So I think that that’s a great way for getting yourself on the social media. Find someone who you trust and whose opinion you value and tell them, “I’m going to do it — dare me to do this, I’m going to do it.” And use that as your ownership to actually go and force yourself to execute. Because like all of us, we’re more accountable to appear to a friend or to a family member than we are to ourselves. So we might tell ourselves, “I’m gonna go on social media, I’m gonna start a GoFundMe page.” But until we tell Andrew live on Facebook that I’m gonna do it, we have now created accountability — because if we don’t, Andrew’s gonna bust my chops for the next 20 years about “why didn’t they do a GoFundMe page?” And that accountability forces us into action sometimes. Rodrigo Fernandez: Brad, come over here! Come and join us, Brad. Brad Celmainis, everyone, now is joining us. Okay, so now I want to jump a little bit into strategy. So, you know, as director of marketing for a technology company, I drive a team. And my team works really really hard at executing the strategy that we sort of sit down around the table and develop. And you know, it’s actually quite beautiful, in fact, to see it being executed and seeing the results right away. I’d love to understand how you approach social from a strategy perspective. Now, what do you do or what has been your strategy so far? Has it worked? And what are you doing as a next step to evolve that social presence? Bill Kennedy: As perhaps the least strategic person here, somebody told me about Twitter. I said, “oh, what’s that?” And I created a test account that wasn’t my real name, just to see what it was about. And then I went to a conference and I heard the back channel behind the conference talking about the conference. And I realized, “okay, there’s a lot of power here.” That’s when I switched over, it went live. But it’s like I jumped in with two feet and that’s what I tend to do. It’s like you said earlier, right: it’s about making mistakes, it’s about figuring out what’s really going on here, right? I know we’ve all lived through that time when they were talking about gurus, and then we moved from conversation to just shouting our message out there. And I think now it’s pulling back to “we really want that conversation”. So I think that for me, it’s not so much strategy as just being aware of what’s going on around me and reacting to it and just trying to stay straight and keep the mission in my heart, right? Like, what I’m trying to do is get the message out to nonprofits — how can I do that best? And then just reacting to what happens. Tiffany Stewart: So I actually started because I was trolling my daughter on social media. [Panelists laugh] Honestly, that’s how it really started. I got a Twitter account, like, “oh, let me just see what she’s tweeting, just making sure that I’m the good mom.” And then I realized the strength of the potential that I had with Twitter, with being able to help grow our community. And really that is what I use social media for. It’s not really for my own business — my own business, I’m doing quite well. It’s growing our tribe, growing our community that I feel is super important. And giving back — because I’ve had so many years of experience and I just want other people to kind of learn from my mistakes and to learn from what I’m doing. And I just love sharing that. And I think by staying true to that, we’ve actually grown a much stronger community. We could probably have bigger numbers, but I think the value of the people that we have in our group and the contributions that we have and the content that we have is exactly where we want it to be, because we stayed true to the intent of what we wanted to do. Andrew Wall: So I’m kind of like Bill. I leap before I look. You know, I kind of go into whatever it is that is intriguing me and that interests me. I’m horrible about not having a plan. You know, I get flack for that all the time, about just randomly going live — like no plan, no schedule, haven’t told anyone. Oh, you just walk by me, so we’re going live. The best was at Thrive a couple years ago. I had this camera on my shoulder, a GoPro, and I was experimenting with live for the very first time. And I sit down and there’s Melika Hope. And we’re talking about Self-Employed, I think it was, and she’s like, “is that thing on?” And I’m like, “don’t worry, it’s not working; it was on earlier but it’s not working.” We have this whole in-depth discussion about Self-Employed and sales tax and what’s going on, and it turns out that it was on and streaming the whole time. And if you know Melika, she’s a powerlifter, so I was kind of scared shitless. I’m like, I think I have to tell her this but I’m really afraid to tell. But I mean, that’s just me. Like, I just jump in. I wish I did more planning. But what my strategy is, is to just mature. Just like everything in life: the more I do, the more I learn and the better I get. So I experiment with new things, I try new things and as I do it, I see the things that work and I see the things that don’t work, and I learn and grow. So that’s my strategy. Matthew Fulton: I think if I was to talk to an actual marketing company, they would tell me I’m doing it wrong. Pretty certain about that. But the area of difficulty I’ve had is: everybody always wants to be authentic. They want to try to build a brand of themselves. How in social media are you supposed to [do that]? I have an accounting company, Parkway Business Solutions, and a software company, Vendorsync. And then really, I’m the persona. So trying to find the right way to balance the three of them, but be genuine about it. The process by which I’ve been trying to do it is for Vendorsync, obviously my target audience is accountants and bookkeepers, which are my people — it’s what I do. So I’m probably going the long way, [but] I try to make friends. They always say you’ll buy more from a friend, right? So my goal is to make friends, get the opportunity to show them what this application can do, and earn that right for them to be willing to test it, try it, and go forward. But how do you keep the balance between the three different ones? It can be can be difficult sometimes. Brad Celmainis: Well, first of all, Rod, I’d like to say I’ve really noticed a difference since you’ve come on board with Method. You know, we touched base when you first started. I love what you’ve done with the with the place, so congratulations on that. So like Bill was saying earlier, he went off with it with a fake name. I just used my name. It’s unique, so I knew no one else would have it. But when I went into business I realized, okay, now my brand and my business and my personal life is all sort of intertwined, [so] we have to be careful here. And I was almost cautious about how I approached it. And I started attending an event in Calgary called Social Media Breakfast. It’s exactly what it sounds: you go for breakfast and you live tweet the event. And there’s speakers, and you know, we just saw Graham Sherman speaking — that’s where I met him, was at a Social Media Breakfast event. He actually hosted one. And I learned about live tweeting, sharing the moment, and engagement and talking with other people. So that’s when I really started enjoying the Twitter side. Then on Facebook, you know, people were friending me as I started my business. It’s like, I don’t want people to know my personal stuff. And then you realize that all these people — you talked about friends, Matt — that’s what it became, is all you guys sitting here with me are my friends first and I don’t think of you in any other way. We just all happen to do similar things, we’re in the community. And we had this conversation last night — I was talking with Mike DiLauro — community and tribe, it’s that friendship part that actually brings us together. And that’s how I’ve got clients; a lot of my clients are my friends. So it’s that social side, people can’t forget that part of it. It’s not a broadcast media that we have here, that we’re just, “buy my stuff, look at what I think, bla bla bla bla bla.” People actually don’t care about that stuff. They’re not gonna retweet your stuff because you shared some article. They want to know what you think about something. So it’s really the engagement side. And that strategy, it’s taken some time. I’ve talked to some marketing experts and they actually like what I’ve done. They tell me, “don’t mess with it too much, but we have some ideas on how you can build upon it.” So that’s ultimately the strategy I’d like to work on eventually. But you know, everything costs money and social media is probably the cheapest way to get your name out there, right? I haven’t sent a bill to Twitter for a while. Rodrigo Fernandez: So I think to summarize: Know your audience. Leverage the platform where your audience is hanging out, right — not some random platform. Be yourself, be authentic. Test things. Don’t be afraid to fail. And don’t have a strategy. And have a ton of fun, which I think you know goes without saying, I think it’s absolutely true. Friends, it was a pleasure having you. It was a lot of fun, despite all of the little failures out there — that’s all part of the game. And I hope to do this once again at some other time. Stay tuned because next year, we’re gonna have a ton of content. I mean, it’s already December, so should we should we say “Happy New Year” already? But yeah, we’re gonna have a ton more and we’re looking forward to Scaling New Heights in June. And we will see you all later on. So say “bye,” everyone. Take care. Ciao! Want more #QBConnect content? Check out our full coverage of QuickBooks Connect Toronto 2018!